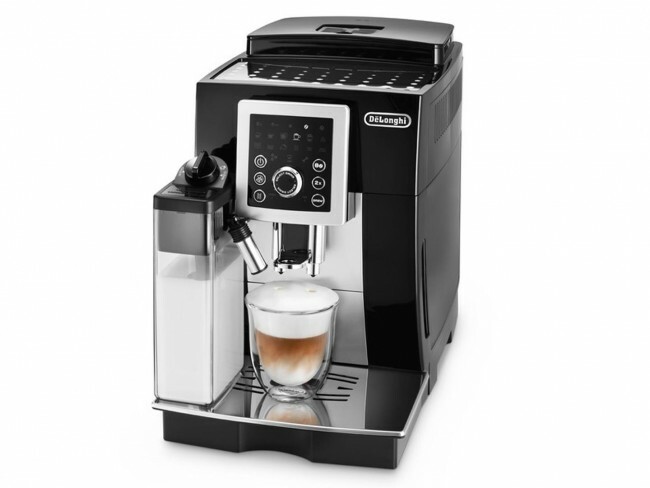 Make mornings a little easier with the Delonghi Magnifica S Cappuccino Smart Espresso Machine. Want a latte? Simply plug in the milk carafe, turn the dial and brew! Along the way, you have the option to select milk froth type and double brewing options for a little more pep in your morning step. 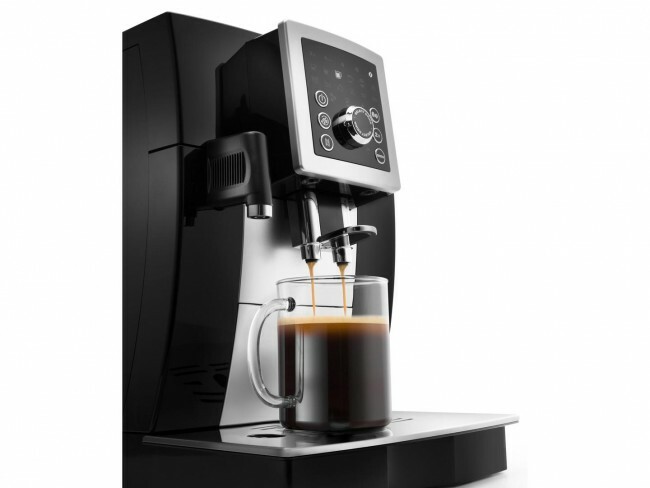 The Magnifica also features automatic rinse cycles, a front-facing reservoir and a removable brew group to make maintenance as easy as brewing! Double Thermoblock - Dedicated heating elements for both steaming and brewing give you on-demand heat without the wait of traditional boiler machines. Front-facing Reservoir - Refill the 1.8 L reservoir without having to pull the machine out of its proper place on your kitchen counter. Removable Milk Carafe - The refrigerator-safe design of the milk carafe makes it easy to pop on and brew delicious milk drinks in seconds. LatteCrema System - The carafe also features Delonghi's LatteCrema system for easily adjustable milk foam. Sliding Spout - Brew directly into a travel mug or demitasse with the adjustable height of the Magnifica's brew spouts. Brew for Two - Two espresso spouts and a dedicated 'double brew' button lets you pull shots two at a time. Self-rinsing - Automatic rinse cycles keep the Magnifica clean at startup and shut down. Removable Brew Unit - The Magnifica's brew unit pops out for easy maintenance and cleaning. Bypass Doser - Trying a new roast? A top-mounted bypass doser lets you use pre-ground beans without having to empty your hopper. Pared-down Operation - Even early birds can navigate the simplistic menu options and select their morning coffee of choice. It brews in under a minute, too! Kitchen-sized - The Magnifica S squeezes a lot of technology in a fairly small footprint, especially when compared to other Delonghi models. Milk Carafe - The removable milk carafe and new frothing system makes one of the best superautomatic cappuccinos we've tested. 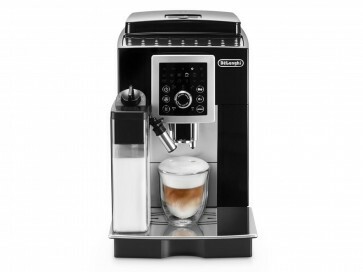 Price Point - While you sacrifice the control and programmability of nicer models, the Magnifica Smart is a great value. Creaky - The case is plastic and the actual operation of the machine is loud and hollow sounding. Crowded Spouts - The Magnifica's small stature is great, but doesn't leave a lot of clearance between the milk carafe and the coffee spout. Oily Beans Beware - Like all superautomatics, the Magnifica Smart's grinder will clog on oily, dark-roast beans. The new Delonghi line adds better milk steaming and frothing capability over its predecessors with the addition of the LatteCrema system, as well as a lightly redesigned UI while moving access to the brew unit to the side of the machine behind the reservoir. The Magnifica S Smart features the click-knob control found on the Magnifica S, but lacks the screen, custom drink programming, one-touch cappuccino and milk menu buttons, coffee length settings and auto-on functionality of the Eletta and the Magnifica S.
Remove the brew group and spray it down with hot water (no soap) about once per week.